Team Balika, a group of community volunteers who support a grassroots intiative called Educate Girls, won the Leader in Volunteer Engagement Award during the 4th edition of the iVolunteer Awards for their work to reduce the gender gap in education by spreading awareness for the importance of educating young girls in their village. With seven offices in India and 350 nonprofit partners, iVolunteer is one of the largest affiliates in Points of Light’s global network. Last year alone, the organization engaged more than 10,000 volunteers in service across 25 cities. However, it wasn’t always that way. iVolunteer was established as a solution to the challenges faced by Indian nonprofits in recruiting volunteers to serve their causes. Shalabh Sahai, co-founder and director of iVolunteer, explained that when the organization was founded in 2001, nonprofits worked in silos and, as a result, had trouble engaging volunteers – particularly middle-class citizens who had the resources to give back, but for whom volunteering was not a part of their culture. “In the beginning, the idea was to found something which got people to volunteer, that would allow people to work with the nonprofits to lend a hand in all the good work they were doing,” said Shalabh. The result was the iVolunteer platform, which is the organization’s online database of service opportunities that allows volunteers to search by keyword and pick projects that fit their interests. “Over a period of time, we realized that simply putting together a platform would not work because volunteering itself was in a very infant stage and people did not understand NGO culture and NGOs did not understand how to engage the upcoming middle class,” explained Shalabh. To address these issues, iVolunteer put together a number of programs that would both help nonprofits appeal to volunteers and help volunteers understand the value and importance of giving back. Archana Raghuram (left), senior director and global head of corporate social responsibility at Cognizant Technology Solutions, accepts the Leader in Employee Engagement Award during the 4th Edition of the iVolunteer Awards on behalf of Outreach, Cognizant’s corporate volunteering arm that promotes technology education in Indian Communities. 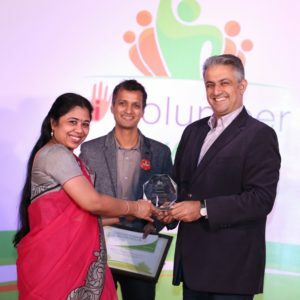 Cognizant Outreach, the corporate volunteering arm of Cognizant Technology Solutions, received the Leader in Employee Engagement Award during the 4th edition of the iVolunteer Awards for its program that promotes technology education in Indian communities. Left to right: Archana Raghuram of Cognizant Technology Solutions; Shalabh Sahai of iVolunteer; Dr. Akhil Shahani of the Shahani Group. 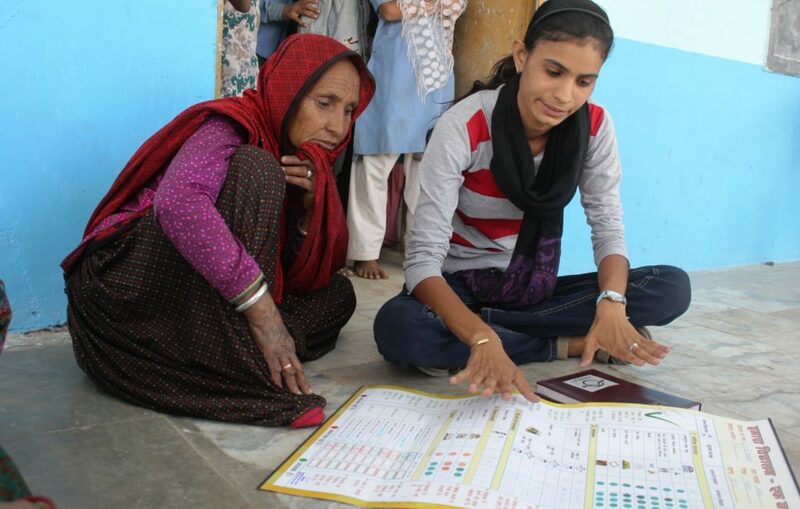 Though this type of programming is common among the members of the Points of Light network, iVolunteer is unique because it operates as a social enterprise rather than a nonprofit. Social enterprises apply commercial strategies to improving communities – making profits is as essential to their success as making an impact. For iVolunteer, Shalabh explained, this structure was necessary because limited funding made scaling its services to support such a large community difficult. Though the organization has come a long way in making volunteerism a part of Indian culture, when taking stock of their accomplishments in 2011 – one decade into their work – they found there was still a distinct lack of understanding among Indian citizens about why volunteer service is important. Shalabh explained that, for example, taking time off from work to give back was often not permitted by employers. Furthermore, there was little to no recognition for the good work being done by volunteers across the country. “If someone wants to volunteer today, none of their peers understand or appreciate that work, nor would their employer understand or appreciate that work,” said Shalabh. Indiability, an organization that helps change attitudes towards people with disabilities and empowers them to lead full, independent lives, received the Leader in Volunteer Engagement Award during the 3rd edition of the iVolunteer Awards. In 2012, the organization instituted the iVolunteer Awards with the objective of spreading recognition and appreciation for the work that both volunteers and nonprofits were doing across the country and internationally (in partnership with VSO International, iVolunteer sends volunteers all around the world to participate in service projects). With categories that recognize nonprofits, youth, employees and corporate volunteer programs, the iVolunteer Awards seeks to honor all types of volunteers. One award in particular, the Volunteer Hero Award, lifts up the recipients as heroes, helping to not only raise awareness for the work of the individual volunteers, but also reposition volunteerism as the pinnacle of community development in India. The awards program has accomplished two things for iVolunteer. The first is identifying new benchmarks established by volunteers and nonprofits that others can use to measure their impact. The second is shedding light on new volunteer models and projects that are making an impact in a unique way. One example is the Indiability Foundation, recognized with an iVolunteer Award for their initiative in which disabled people teach life skills to non-disabled people in rural communities. This program completely challenges pre-conceived ideas of “the haves helping the have-nots,” said Shalabh, additionally bringing pride to the families of the disabled persons and the individuals themselves. Through robust programming and innovative initiatives, iVolunteer has uniquely adapted to the needs of volunteers and nonprofits in their community using a trial and error approach, while maintaining focus on the organization’s central objective – engaging more individuals in service to their communities. This adaptability was central to its early function and development and, today, makes iVolunteer an invaluable asset to Indian nonprofits and volunteers alike.